Automatic Trim Tabs for Inflatable Boats and RIB’s. Smart Tab SX Series for boats 13′ to 15′, 30 hp to 40 hp. Smart Tabs SX Series for boats 13′ to 15′, 30 hp to 40 hp, available in black. As an extension of the boats running surface, Smart Tabs change the performance and handling characteristics by automatically adjusting to water pressure, boat speed and payload. At slow speeds, they deploy downward to increase stern lift keeping the boat level, allowing the boat to plane easier and faster. At cruising speeds, they are pushed to a horizontal position (retracted), but remain under a load creating ride control like shock absorbers. Automatically gets your bow down as soon as the bow rises while accelerating. Easy to Install – Smart Tabs use a nitrogen gas actuator to automaticlaly regulate the trim plate position while underway. The plate size and actuator resistance (pressure) are determined by the boat size and horsepower at the time of installation. Even after installation, the Smart Tabs system can be tuned to the specific boat or consumer’s preference. All of this is done without the need for electric or hydraulic connection, larger feed holes, or manual switches. A few common tools are all that is required for installation in less than one hour. Bennett SLT6 Self Leveling Trim Tabs for Small Inflatables 10'-14'. Smart Tab SX Series for boats 15' to 19', 60 hp to 140 hp, available in black or white. Trim Tabs for the Genesis Inflatable Boat, pair. (Part #16546). Trim Tab Assembled (Pair), for Walker Bay RIBS. 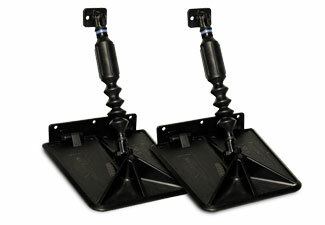 Smart Tab SX Series for boats 12' to 14', 40 hp to 50 hp (4 Stroke), available in black. Smart Tab SX Series for boats 18' to 22', 140 hp to 225 hp (2 or 4 Stroke0, available in black.